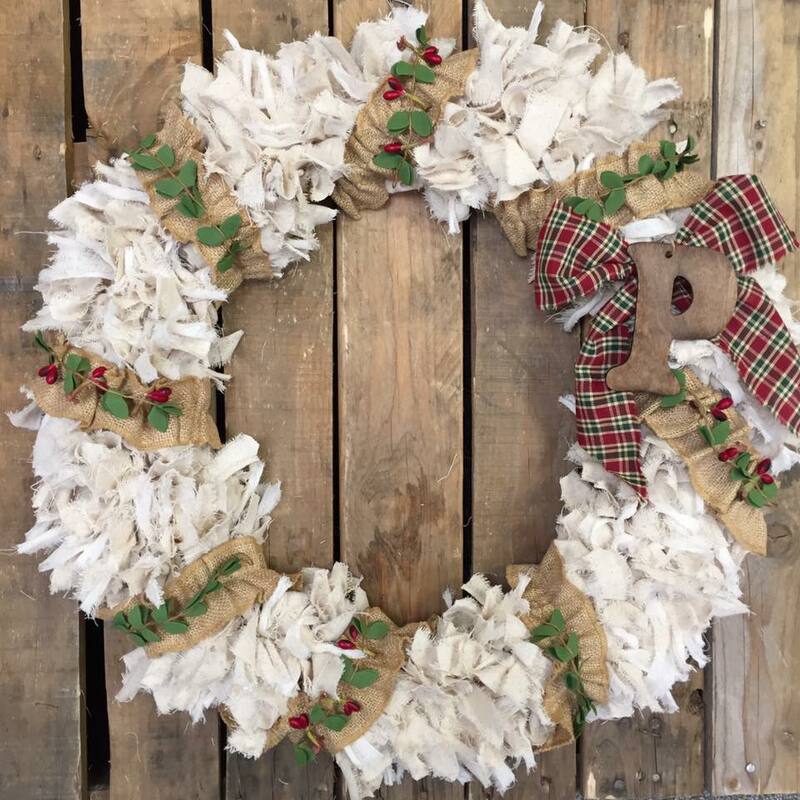 Design a christmas Rag Wreath to suit your style! 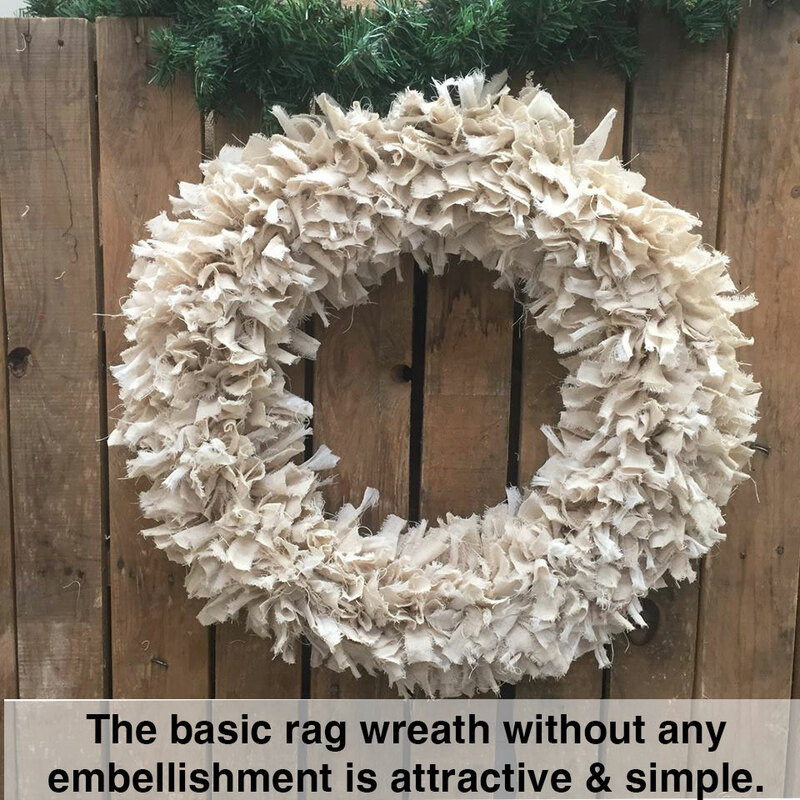 When you start with a basic natural color rag wreath, you will find SO many different ways to embellish it that you may have a hard time deciding which you like best! We ran into that situation in the studio this week. 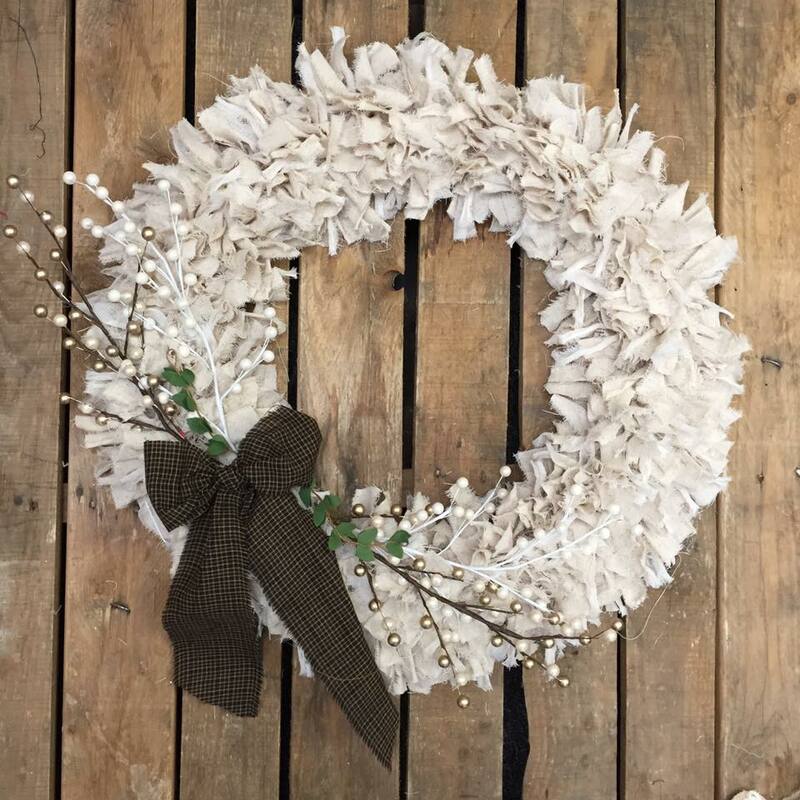 We created a rag wreath in the traditional style using our off-white color Osnaburg fabric and the antique unbleached light weight tobacco cloth. 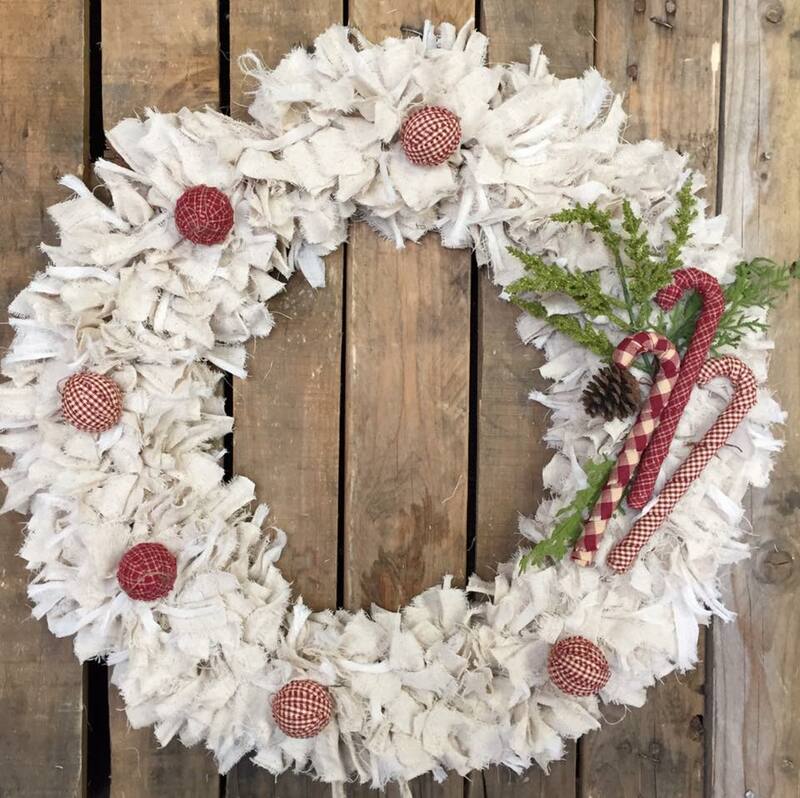 Then we embellished the same wreath over several times using many of our ornament products and some purchased greenery and berries. This was a super fun project for us and we photographed each of the concepts to show you here. 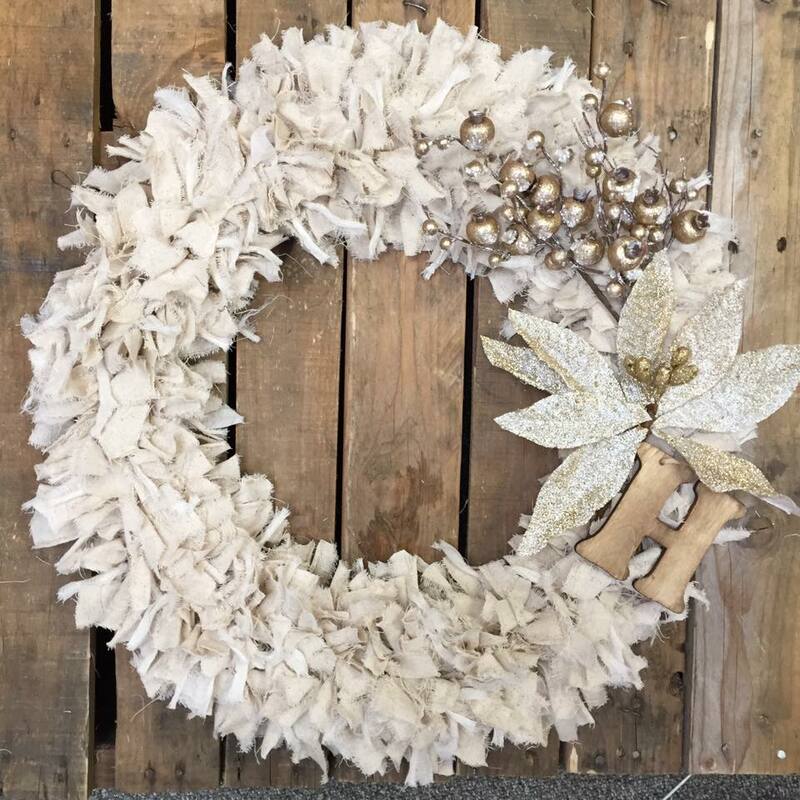 Enjoy these pics and if you feel inspired, there is a brief tutorial at the end showing how we made the basic wreath. If you make something creative, send us a picture! 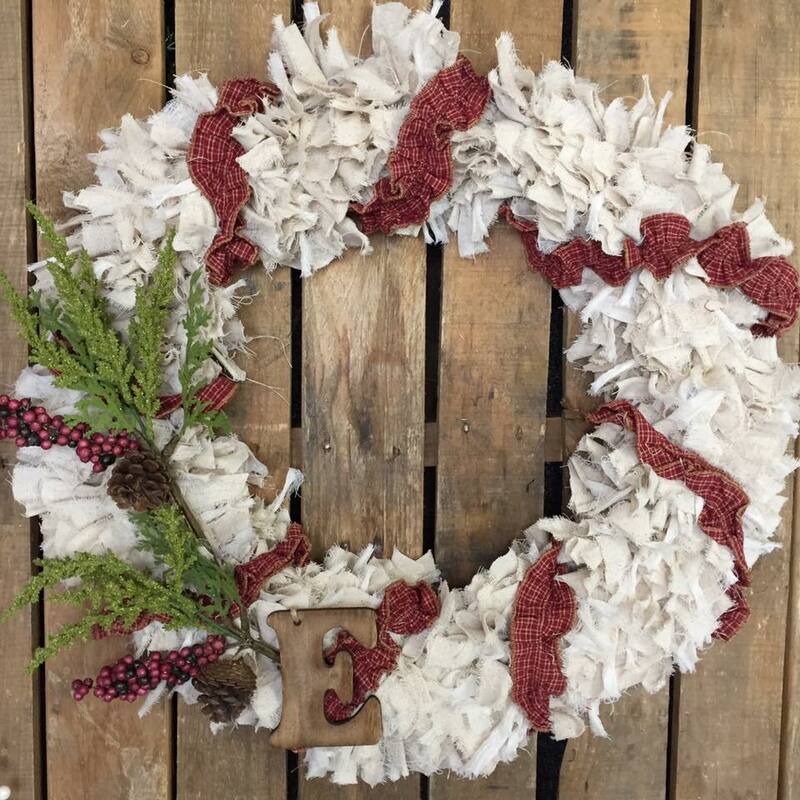 We love seeing what our customer do and sharing their pictures on our Facebook page. 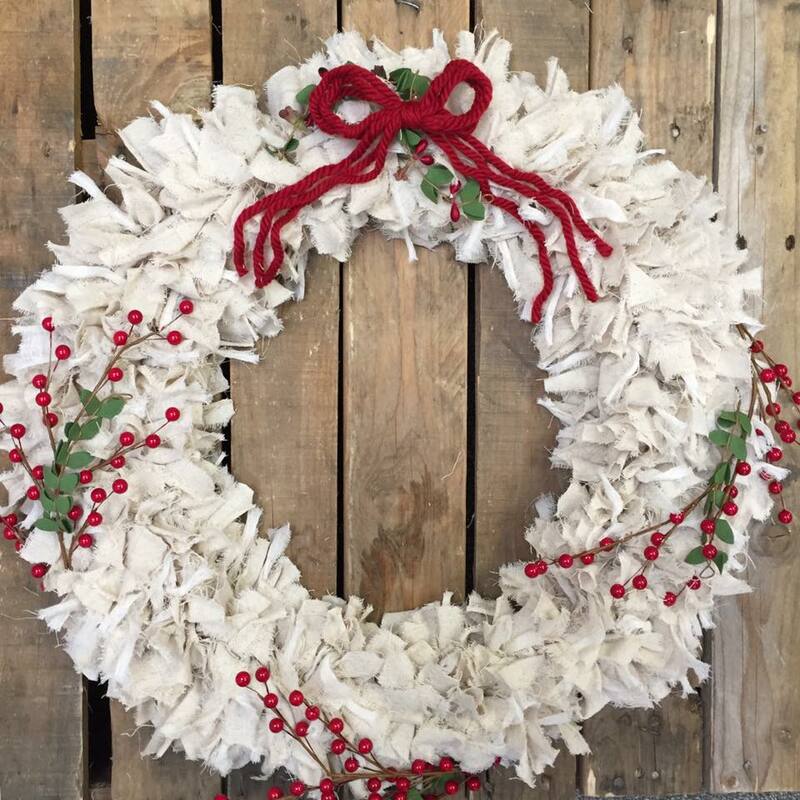 Below are some pics of rag wreaths we have made in previous years. I've included them here as inspiration. 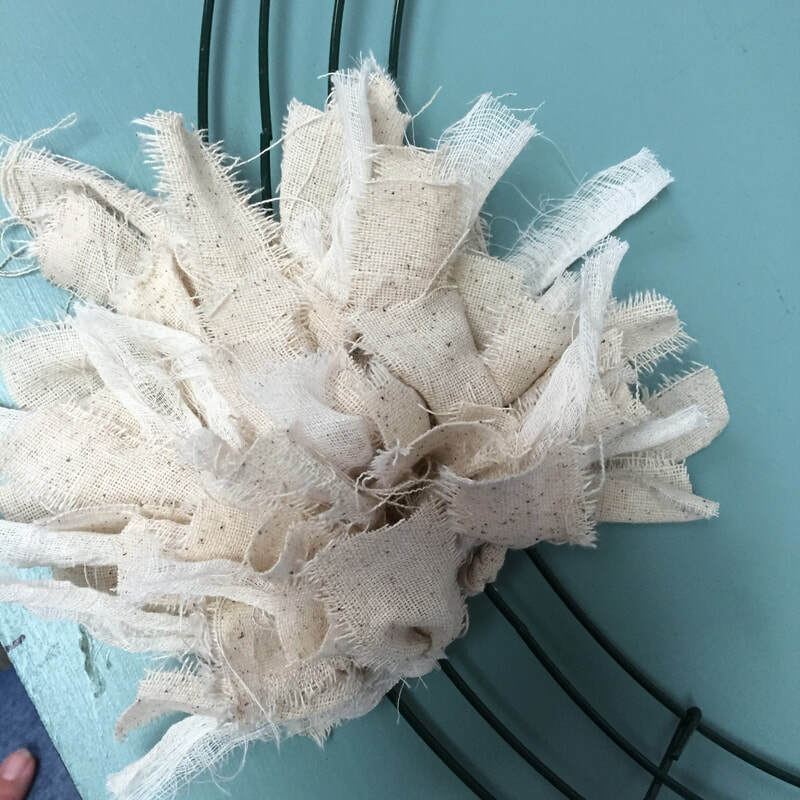 Making a basic rag wreath base. 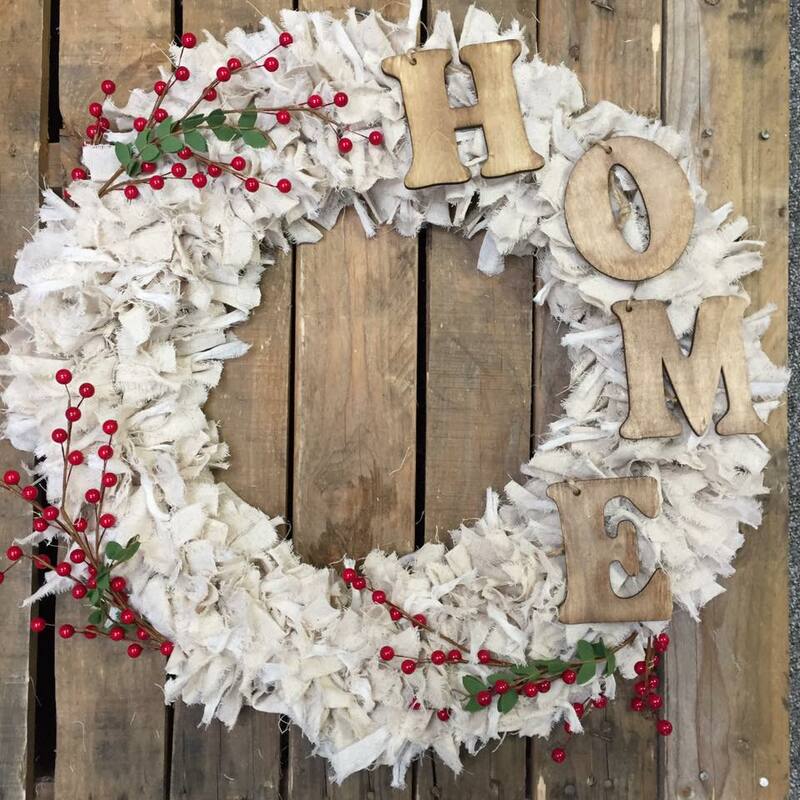 You will need a wire frame wreath base. 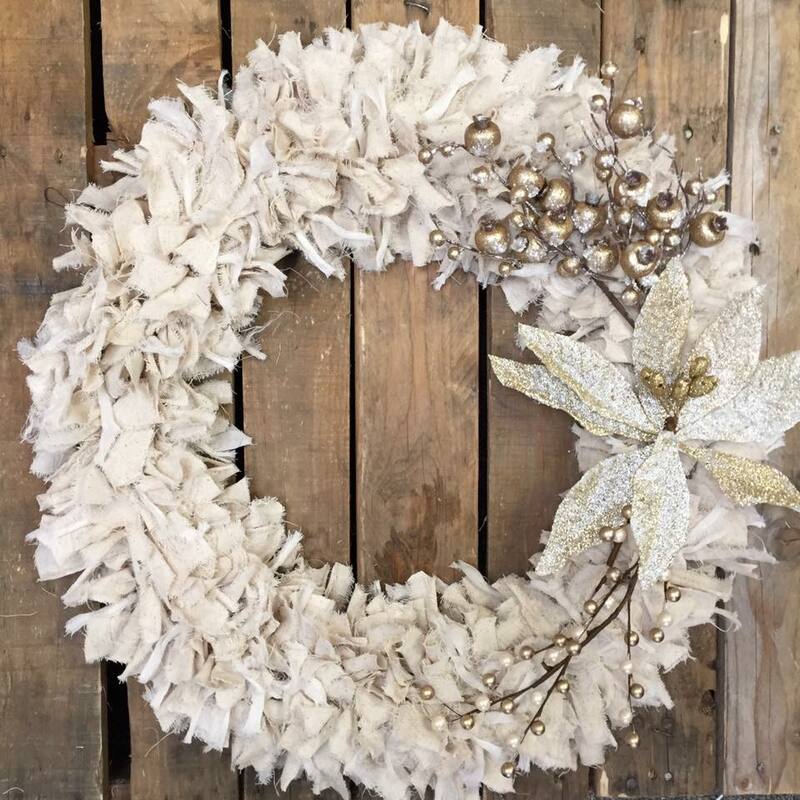 These come in different sizes and are easily found at most floral or craft stores. I can usually find them at our local Walmart in the floral department. 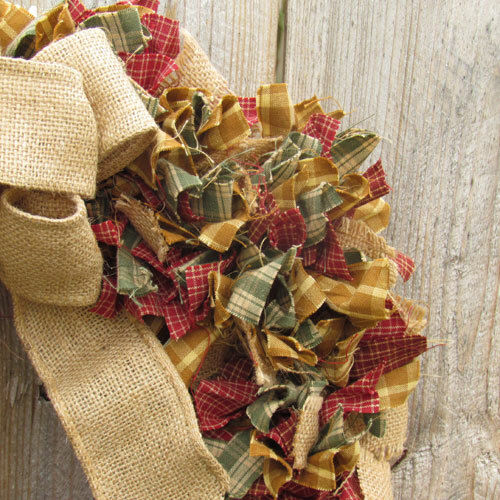 You will also need about 3 yards total homespun fabric. 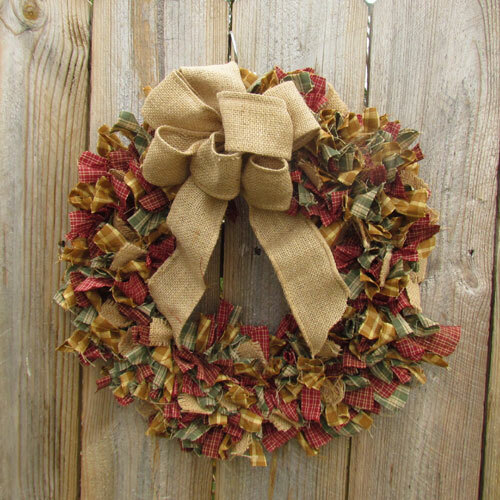 This can be all one color like the wreath we are featuring here or it can be various coordinated colors or it can just be your remnant stash. 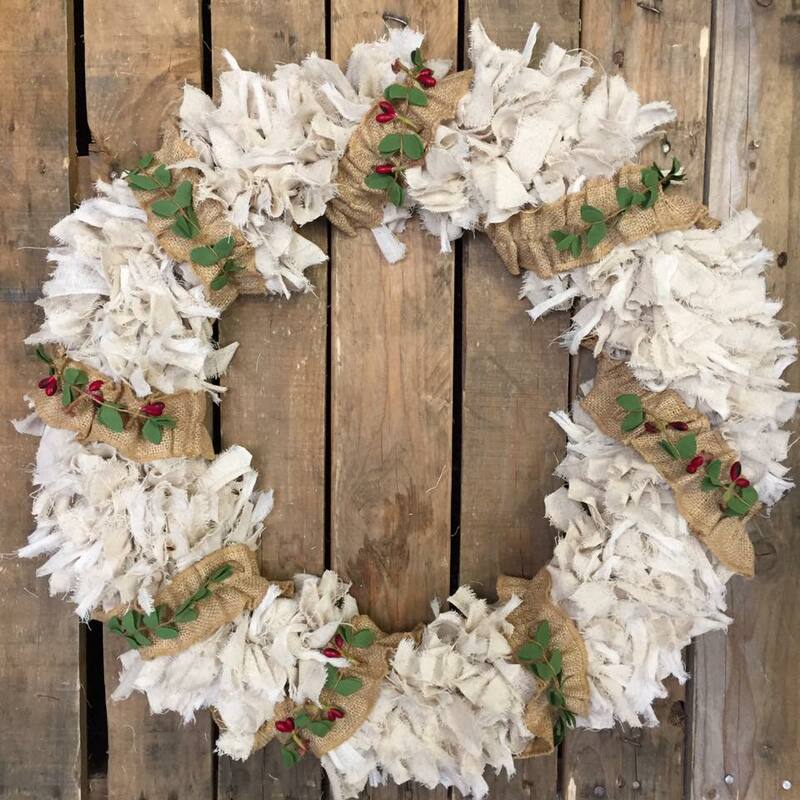 In this wreath, we used about 2.5 yards of Osnaburg and 1 yard of unbleached light weight tobacco cloth. 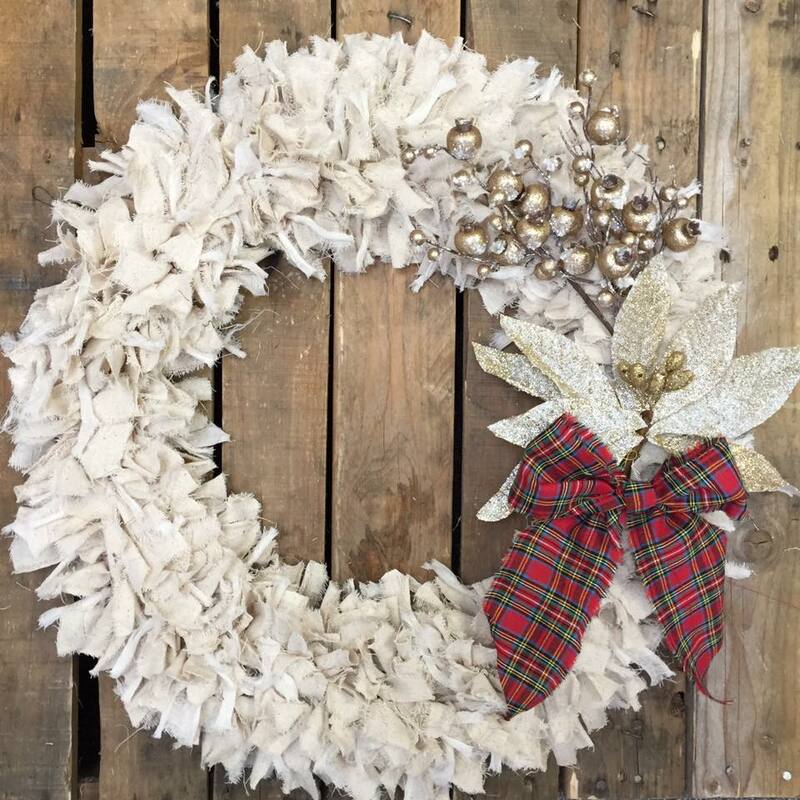 It's important to use fabric that is not printed so that you will not have the unattractive back side of the fabric showing in your wreath. 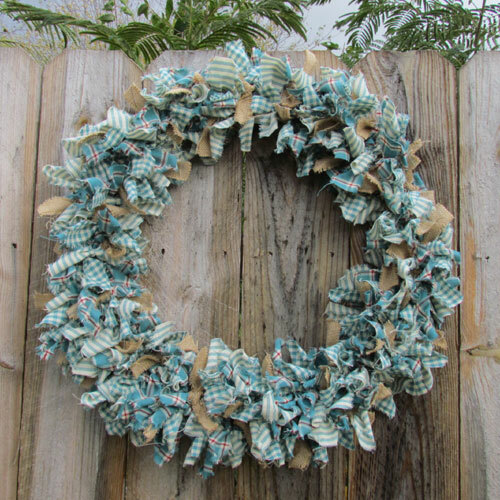 Homespun fabric is perfect for this! 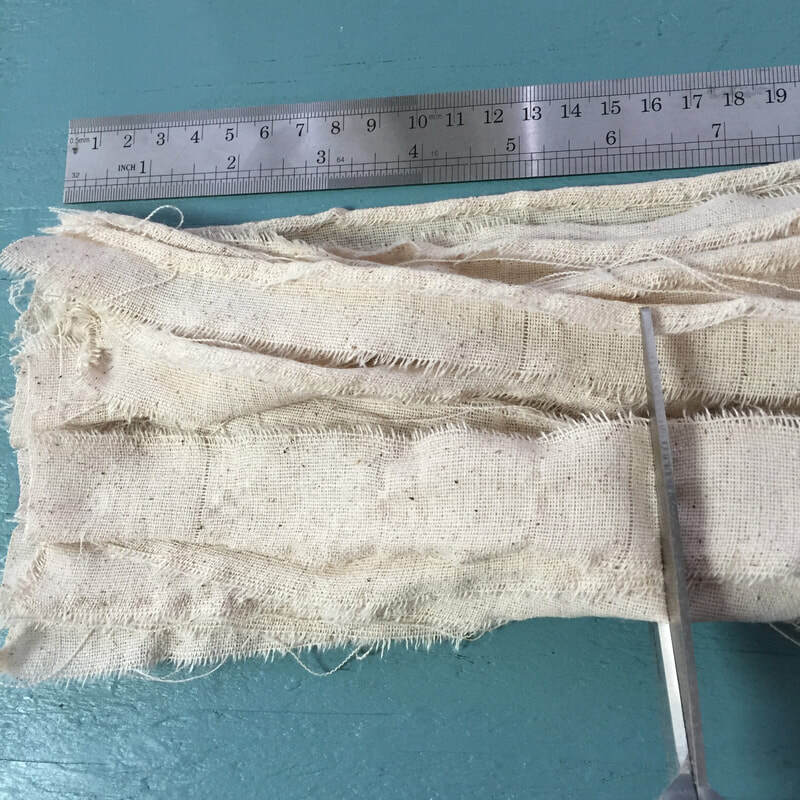 Tear your fabric into 1" wide strips. 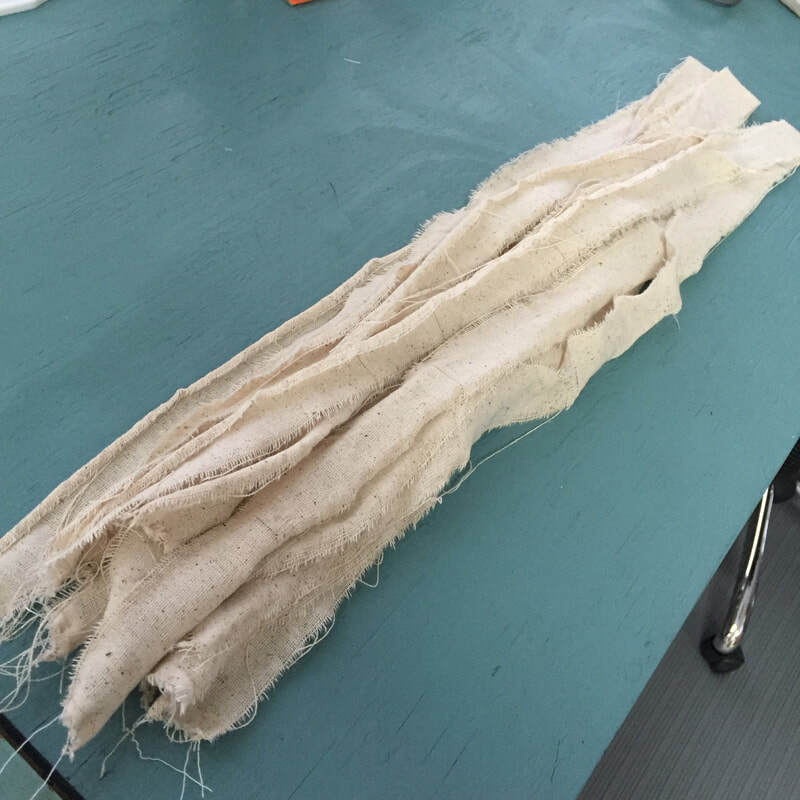 Then cut those strips into 6" lengths. 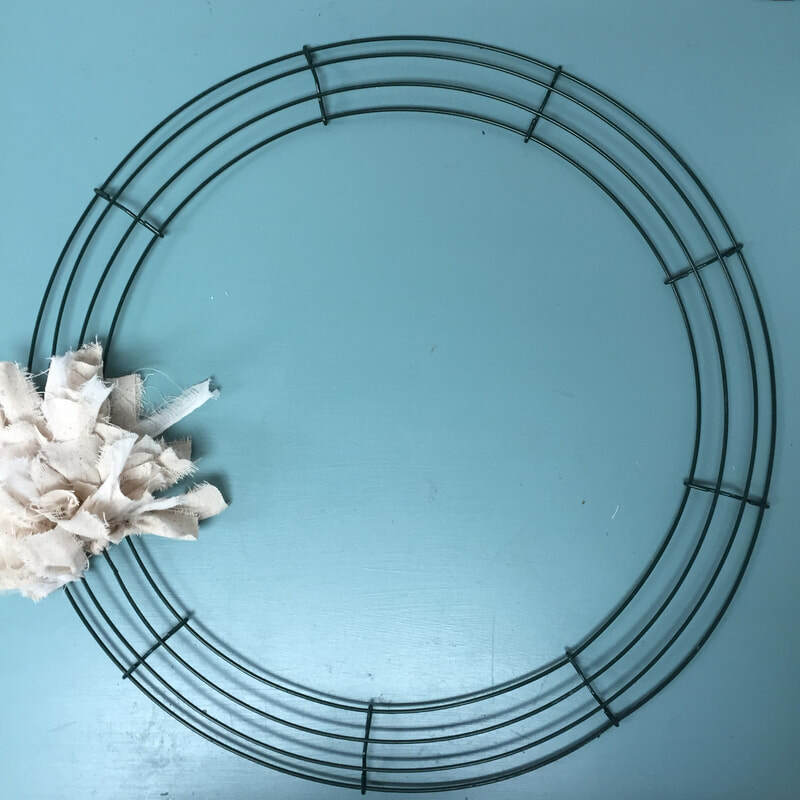 Tie one 6" strip to your wire wreath just using a simple single tie. Making a knot is not necessary. 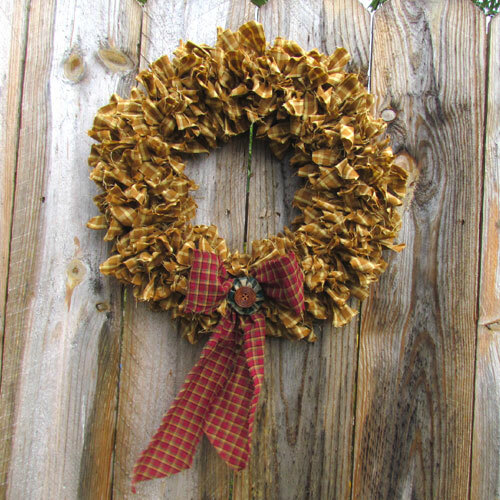 Continue tying the strips on one section of the wreath at a time until you have reached the desired fullness. 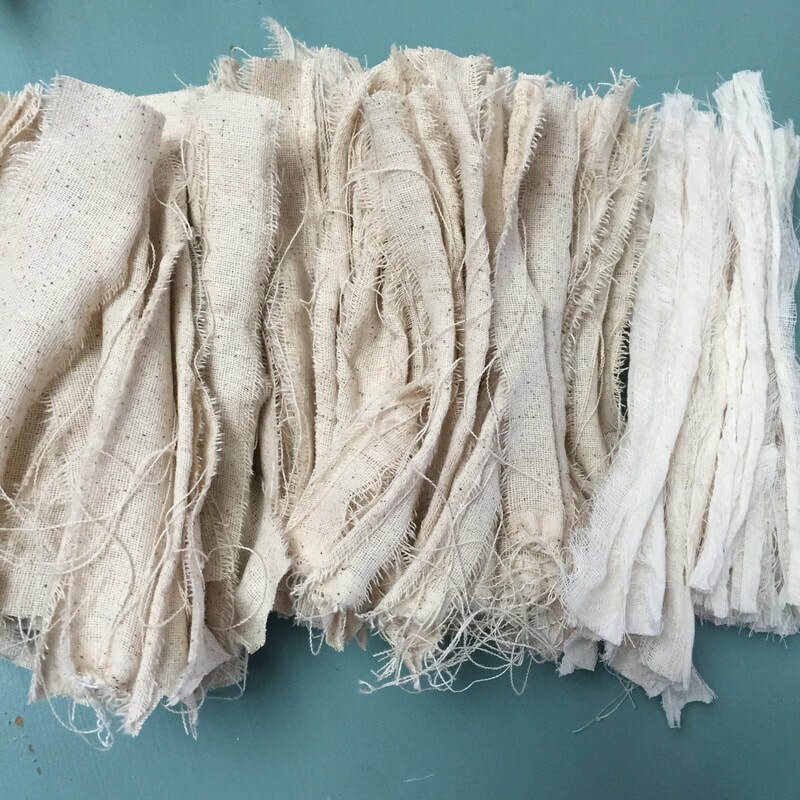 If you are using different colors or textures just randomly mix them as you are tying. 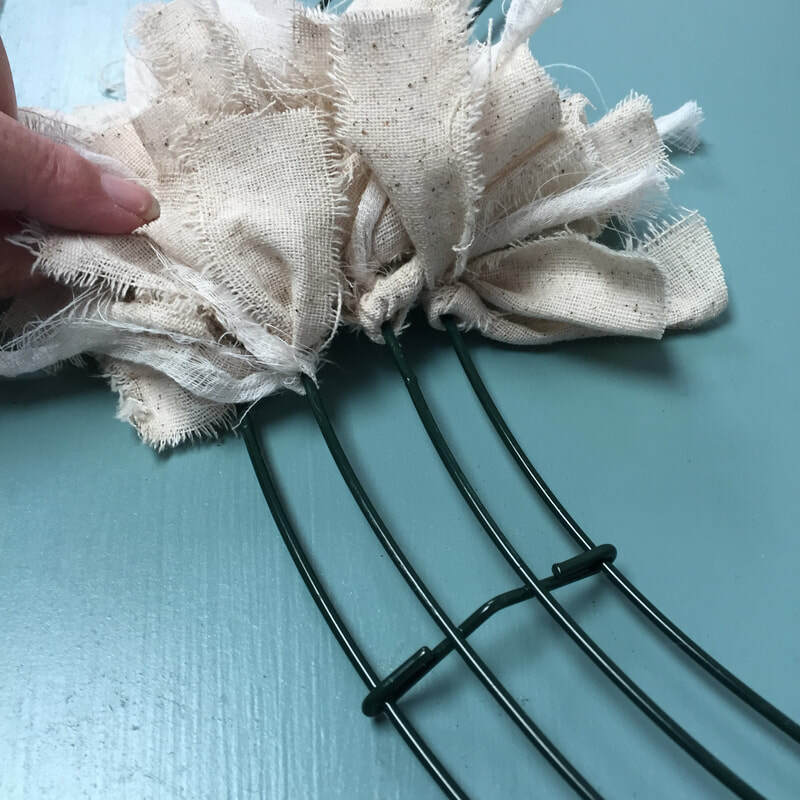 Make sure you keep all the ends pulled forward to the front as you go. 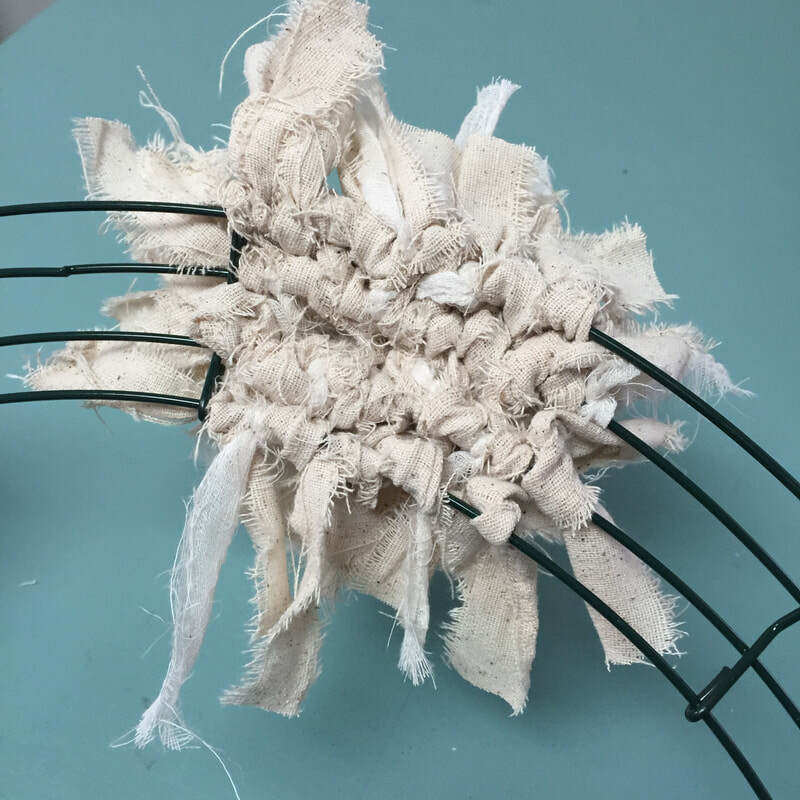 The back side should just be knots as shown in the image below. 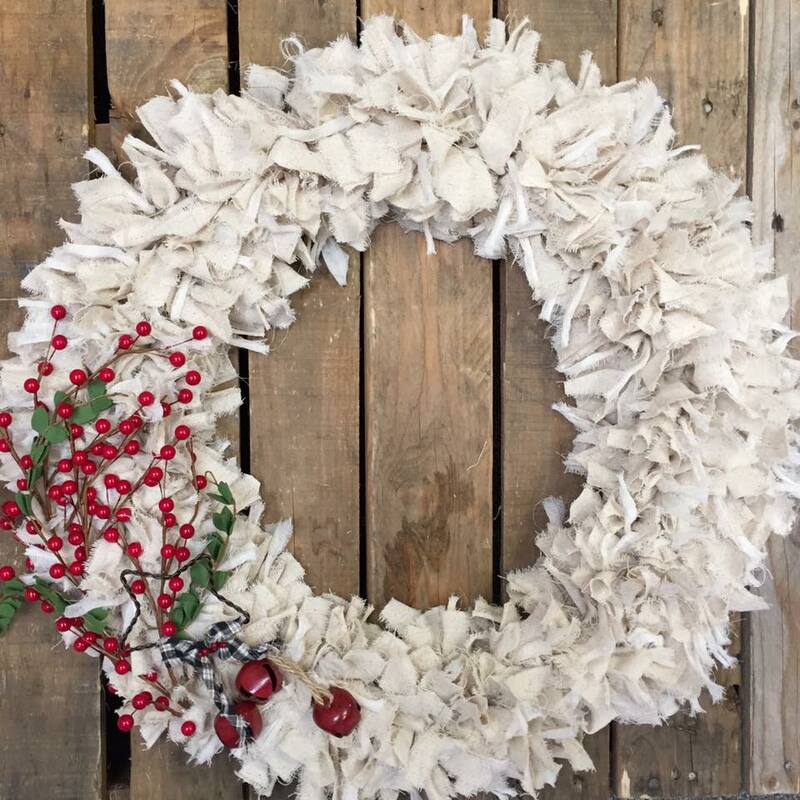 When you are satisfied with the look of the rag wreath, either use it as it is or embellish it as desired. This is a good movie night project. I estimate it took me 2-3 hours to tie all the strips. I'd suggest getting the kiddos involved as much as possible because your hands will get a little tired if you do this all in one setting.